With Magnet Commerce you can define questions that you want to ask your customers during checkout. These can be general survey questions such as "how did you find our website? ", questions concerning your terms & conditions such as "Do you accept our shipping and return policy?" etc. Figure: Use the "Marketing > Checkout Questions" tab in the Administration Panel to add survey questions on your store's checkout form. In the "Marketing > Checkout Questions" page you will find a list of all the questions currently appearing on your store's checkout form. You can use the arrows under the "Order" list to change the order of the questions on your storefront. You can also click Edit to edit a question or Delete to remove it.
! Check out questions are setup independently for each language. So if you have more than one language enabled, any checkout questions you add in one language don't get copied to other languages. Change between the language tabs on the "Marketing > Checkout Questions" page to view, add and edit the questions for each language. On the storefront, each language contains the checkout questions set for that language. 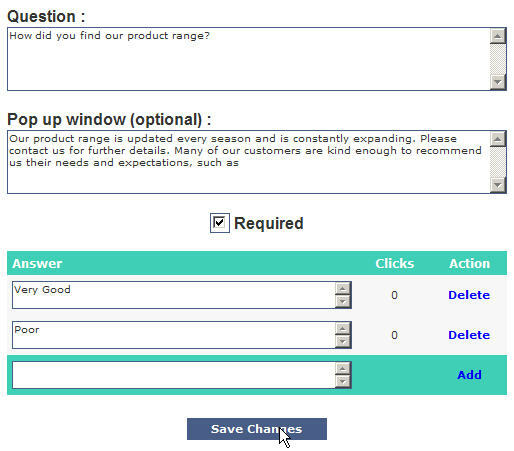 Figure: Type your question and click on "Add checkout question" to add a new survey question. Figure: Click "Edit" to view/edit the contents of a question. Or by clicking on Add checkout question when adding a new question (see previous section). Figure: The Magnet Commerce question editor. Required: Tick this box if the visitor must answer this question in order to complete checkout. If this question is required, a red star will appear next to it on the checkout forms. Answer: Setup pre-defined answers to this question. The answers will be presented to your visitors on a drop down menu, next to the question. To setup an answer, type it in the text field and click Add. Repeat this for all the answers you want to add. To delete an existing answer click Delete. The "Clicks" list shows the number of times an answer has been chosen by your users. When you have finished editing the question click Save Changes to save current settings. Figure: Questions as they appear on the checkout form. As you can see in the previous picture, the order is the one set in the "Marketing > Checkout Questions" page. Pre-defined answers are presented in drop down menus. Figure: Questions with relevant text in a pop up window appear as links. Figure: Pop up window containing text relevant to the question. Use the "Marketing > Checkout Questions" tab in the Administration Panel to add /edit survey questions on your store's checkout form. Use the question editor to: edit a question, add pre-defined answers to a question, define a question as required (must be answered for completing checkout, e.g. terms & conditions acceptance) and add any text relative to a question (the text will appear on a pop up window when a customer clicks on the question).